Where’s the disconnect? If people “believe”, why won’t they act? In other words, we need them to “want it” before we can expect them to act on it. Utilities can capture the health, home and family categories relatively easily, but framing them from a traditional energy efficiency standpoint doesn’t create desire. Successful energy efficiency marketing will re-frame energy efficiency by focusing on what truly matters to customers, what they will relate to, and what will get them to act. A terrific example of a big brand doing this is JetBlue. They’re a “how-to guide” for building a truly customer-centric brand and long-term loyalty. Like energy efficiency, the benefits of flying are in the result – a vacation, spending time with relatives or coming home. And soon to be… Free WIFI + power outlets on every row! 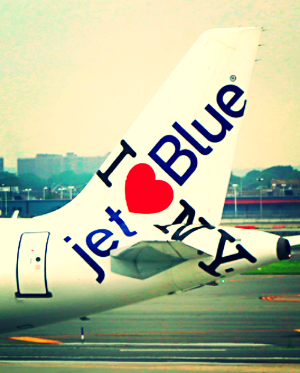 We’re not surprised that JetBlue has won their 10th consecutive, customer satisfaction award with J.D. Power. When it comes to energy efficiency, why aren’t we talking to customers about the personal benefits they’ll actually connect with? Financial savings is important, but the long-term connection will come from the benefits that impact what people prioritize most: health, home, family, entertainment, and self. The results of improving your home through energy efficiency are much bigger than financial savings; it’s a more comfortable home at a controlled cost. It’s a more reliable home at a higher value. It’s a safer, healthier home for your family. It’s taking care of your most important asset: home. The financial savings make it easy for people to commit, but don’t move the needle in getting people to care. For an industry that’s largely never had to be a brand, transitioning ratepayers into loyal customers is a challenge. But it’s also a chance. If you’re interested in hearing the full research report, and the customer insights on making energy efficiency matter, get in touch with Lauren Bell.